Disney World Vacation Package Giveaway! 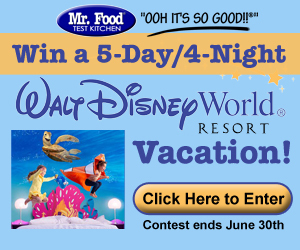 Mr. Food and Disney have teamed up to give away a dream family vacation to the Walt Disney World Resorts in Orlando, Florida. This 5-Day/4-Night vacation package includes airfare, hotel accommodations, transportation, and a $300 Disney gift card for one winner and three guests to the world-renowned Magic Kingdom! Plus, 10 runner ups will win $50 Disney gift cards!